So we went to look at a prespective Pre-K for #1 this morning. The county school system here is apparently very good, but Kindergarten doesn't start until age 5, which is A WHOLE NOTHER YEAR. Not that I don't love having him at home with me, but ever since he turned 4 I seem to not be enough for him. He is so smart (I know every parent says that but MY kid really is a GENIOUS. His mind is a steel trap. I now know where MY excellent memory went before I had kids...) He gets bored with any activity after like 5 minutes. Which is a total pain. (sorry, but it is. It takes longer than that to get any activity set up). anyhoooooooooo........ The pre-K program is not state mandated, which means you have to "screen" your kid for it, and there's not that many spots, and they let you know like 5 minutes before the school year starts if you get in. Most of the private preschools around here are really expensive. Is it like that everywhere? He's never been in anything like that, mainly because of that reason. For a few months at the beginning of the year, he went to a once-a-week for 2 hours "School Skills" class that was a drop-off thing, the first time he ever went to anything like that. And he adjusted pretty quickly. But, he seemed to get bored with that, and I felt like it was WAY overpriced for what we were getting. He's not been going for about 2 months now, and he's asked about it, like, once. So we know that he really needs to be in a program like a 2 or 3 times a week all day school, just to keep him occupied and stimulated!! I know I will be sad when the day comes, and I NOT anxious for him to grow up. This is just the first step on his road to the White House. (so not kidding) We have no idea if he will get in (the free one), and we don't think he will. We don't really fit in any of the categories that get the priority, if you know what I mean. The one we would have to pay for seems really great, and I'm sure he will love it. So keep your fingers crossed, we'll probably find out in a few weeks. In the mean time, we have like 20 swim lessons to keep us busy! So, in an effort to get all my "projects" on this blog, here's a pic of the cake #1 requested for his 4th birthday. 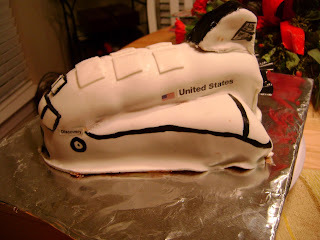 A space shuttle cake. He did change his mind several times, but this is what he landed on. White House, right? OMG thanks for finding me! My parents live in CS so although Trav & I didn't graduate from A&M, we're major Aggie fans! :) Love your blog!